Pielke Sr. – Hypothesis on daily UAH LT records | Watts Up With That? From Climatesci.org Roger Pielke Sr. In the last couple of weeks, the onset of the El Niño, that was discussed on in my weblog on July 11 2009 would appear to be a possible explanation for the sudden increase in lower tropospheric temperatures to a record level (e.g. see the latest tropospheric temperature data at Daily Earth Temperatures from Satellite). This sudden warming is also discussed on other websites (see and see). The location for the sudden warming (in the global average tropospheric temperatures as reported from the AMSU data) at 500 mb in the Northern Hemisphere is not obvious, however, except perhaps for a large area with weak positive anomalies in the lower latitudes. There is some warming in the El Niño area, but it is relatively small. In the lower latitude eastern hemisphere In the southern hemisphere, there is a strong warm anomaly near Antarctica. Maybe that is part of the reason for major region for the large positive AMSU temperature value. This record event is an effective test of two hypotheses. Hypothesis #1: Roy Spencer’s hypothesis on the role of circulation patterns in global warming (e.g. see) might explain most or all of the current anomaly since it clearly is spatially very variable, and its onset was so sudden. If the lower atmosphere cools again to its long term average or lower, this would support Roy’s viewpoint. Hypothesis #2: Alternatively, if the large anomaly persists, it will support the claims by the IPCC and others (e.g. see Cool Spells Normal in Warming World) that well-mixed greenhouse gas warming is the dominate climate forcing in the coming decades and is again causing global warming after the interruption of the last few years. Only time will tell which is correct, however, we now have short term information to test the two hypotheses. The results of this real world test will certainly influence my viewpoint on climate science. July 17, 2009 in Climate data, ENSO. It rose nearly as high in January and returned to near average. I believe that the timing of the current bump being near the peak of the annual graph makes it look more ominous than it possibly is. Re Hypotesis #2 – so the AGW began to manifest itself on July 2009 at exactly 388ppm CO2? In June/July 2007, there was a temporary temperature peak just as it is now. As pilots say, what went up, will also go down. There is a third hypothesis – 3) Because of the way global temperatures are derived, no meaningful conclusion can be made. Sun still quiet today – WUWT. 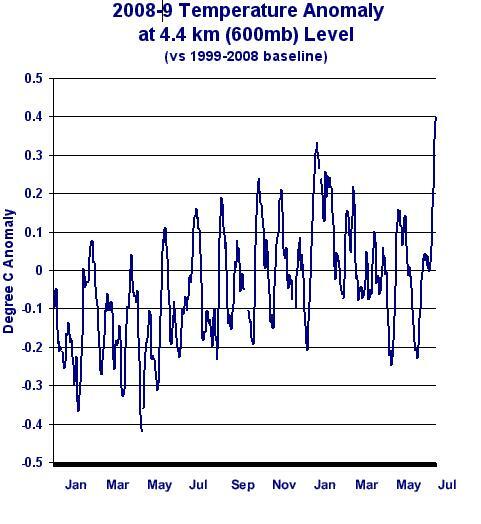 RE Hypo 1 – didn’t that just happen, with rapid average LT cooling from January 2007 to January 2008 of more than 0.6C? Isn’ t there lots of LT data since 1979 that demonstrates this rapid temperature variability? I don’t think either scenario supports the IPCC position – it contains too many unsupported and demonstrably false hypotheses. To the lay-person this anomoly is hard to relate to CO2. The SH seems to have most of the positive anomoly and this has occured in the SH winter where there is reduced solar input into the system. The only possibility (aside from data error) is that this heat is from warm tropical ocean currents and is being dissipated into the high latitude regions (with less atmospheric water vapour) where it can best escape as IR back into space. I would think this is good for longer term cooling ? Neither may be correct, regardless of what the temperature does. I’m not willing to bet the farm here. Of course it’s going to go down now…. The question is: what will be the global anomaly for the second part of the year. Up to now, 2009 is the 6th warmest just after 2004. I see sudden rises (and eventual falls) of a similar scale elsewhere on the graph. So, whatever it is, it is not “visibly” unique. My money is on Roy Spencer and the drop in ocean heat content that will result from the current surge. Will take a while though for the newly warmed air to suppress oceanic heat emission. 2-4 months to peak SST, 6-8 months to peak LTtemp, 12-15 months for LTtemp to drop below Jan 2008. I’d like to ask a question: Are the measuring devices in those satellites capable of being tampered with by a ground station, such as to influence their readings? The Australian BOM is blaming a sudden warming in Antarctica on unusual wind patterns. Maybe this supports Roy Spencer. Talking of the weather it’s certainly been pretty cold in Australia recently. I’m getting fed up with the cold temps in Melbourne. Sorry if I post this twice it didn’t appear to work the first time. Guys– perhaps an explanation of some of the acronyms for those of us out here perusing the site but not really part of Climate World? I started reading Anthony daily a few months ago, and although I’ve pretty much accepted global warming caused by humans, still, a lot of stuff posted here needs to be answered and answered directly. The acronyms, though make it a little hard to follow, ok? I am sorry, but I think this is patent nonsense, the time scale (two weeks) is clearly insufficient to make any climatic deductions of any kind. You should actually tick all the boxes and see what this July looks like compared to all the other ones since 1998. = no trend of any kind. In the past 30 years, how many times has such a three-day peak (rise, peak, fall) been observed? In 1997-1998 – a definitive El Nino event, what were the comparable curves – noting that in that time interval, the rise-peak-fall spanned almost three full years to observe the rise, peak, fall? anomalies will be slightly too warm – but on a daily basis it is not really possible to say what the error really is. Our calibrated daily values will be out after the end of the month. If you use the AMSU site to compare current tropospheric temps at 7.5km (CH06) with previous el nino years 2006, 2003, and 1998, you can see we are generally still cooler there. The heat content of the upper troposphere is generally down, and the current spike at lower elevation (CH05) will dissipate quite rapidly as the upper troposphere warms. The rise in SST should slow next month, then pick up again the month after, before starting to top out the month after that. There was a similar spike in 2007 that peaked on July 1st and subsided about two or three weeks later. 2. Could Dr. Pielke Sr. or anyone else provide a mechanism by which co2 caused the sudden SST warming? 3. Until then, I’ll continue to believe that the only plausible source of such ocean warming is the Sun. As to why the surface water was exposed to more sunlight than usual (slack winds and fewer clouds presumably had something to do with it), that would be an appropriate field of study, worthy of government funding. I would guess that due to the movements of the air circulation systems and the patchy geographical operation of the hydrological cycle the rate of energy transfer from air to space is irregular. Put that on top of the longer term irregularity and patchy geographical variation of the rate of emission of energy from oceans to air and there is plenty of scope for discontinuities in the energy flow through the depth of the air. As per my general climate description the oceans introduce irregularities in the energy flow from sun to ocean to air. I differ from Roy on that point because I think he considers that cloudiness variations are a primary driver of observed changes in climate phenomena. In contrast I suggest that variations in the energy flow from oceans to air drive everything else by changing the rate of the hydrological cycle with all the air circulation systems responding accordingly. It is then left to the air to try to arrange over time that energy leaving the system as radiated longwave has much the same energy value as energy coming in as solar shortwave. Irregularities in the rate of energy transfer from air to space work to smooth out irregularities in the rate of energy transfer from oceans to air. The mechanism is the latitudinal positions of the air circulation systems which in turn controls the speed of the hydrological cycle. It must be so for oceans of water on our planet to exist at all. If any significant imbalance were ever to have occurred then the oceans would have long gone. Nothing in current climatology adequately considers irregular flows of energy between sea and air and between air and space underpinned by another level of irregularity in solar input. The models currently work backwards from meteorolgical observations rather than forward from measurements of net energy flow in and out of the different sections (oceans and air) of the system. In my view the whole plethora of interlinked climate and meteorological events is a direct consequence of variations in the rate of energy flow through water and air. It’s like trying to work out how a car engine works by watching the car driver. What one really needs to know first is the way the engine converts energy into movement. What about error bars on these lovely curves? How big is the 1 sigma? I have seen 4 sigma effects be really and truly statistical outliers and not new particles in my particle chasing days. Climate plots have no error bars , at least not the above. Is the warming the result of warming global SST. AMO and PDO have both been rising[indicates warming] for the last 2-3 months and most ocean SST according to Bob Tisdale’s posts show a warming trend also ? I have been noticing a lot of upper level lows recently over North America. continuing or errors. If I estimate the wiggles on the plot above as a measure of the 1 sigma error, the current peaks is maybe 2 sigma out. Quite probable in statistical terms. The satellite used for AMSU-E daily temps is not adjusted for orbital drift IIRC. I’m wondering if this is a recovery from the SSW (sudden stratospheric warming) in January/February that really messed things up in the N Polar vortex bringing northern latitude temperatures down for four consecutive months. I don’t think it is any coincidence this is a cold summer for much of the NH. Since this doesn’t really correlate well with Nino 3.4 at the moment, it appears to be not so much related to El Nino as it is to yet another belch of heat from the oceans to be followed by one to three months of warming, then another drop. The question in my mind is if the oceans are replenishing the heat lost from these events. BTW, is there a comparison available of UAH vs GisTemp regional data? Personally I don’t buy the one month lag scenario given for the .4C difference for July temps, but am open for discussion. I think GisTemp extrapolation methods, particularly at the poles, are way off the mark. What does he mean? What is “major region”? Regardless of the outcome, isn’t it nice to have real data (not filtered, adjusted, and model derived) with which to test competing hypotheses. Now, I know this might be somewhat heretical in the modern era of AGW hysteria (and Swine Flu hysteria, and _______ hysteria), but nothing like some actual hard science once in a while. I would also tend to agree with hypothesis #1 in this case. Seems like a large area of subsiding air (which would warm, contrary to what is depicted in the movie Day After Tomorrow). This warming air is then being seen by the satellite sounder on AMSU. Our atmosphere is already saturated at CO2 absorption wavelengths. It could only absorb significantly more if we added enough CO2 to double atmospheric pressure, and by then we would all long since be dead of CO2 poisoning (it would displace oxygen near the surface, being a bit more dense). At least, that’s the opinion we arrived at in my graduate school class on atmospheric radiation, where my project focused on using this information to see how we would go about terraforming other planets. Real world test. I wonder. It is very good to have this finally cast in terms of a relatively short scale, testable hypothesis. Of course I am inclined to believe hypothesis #1; but if the data turns out to support hypothesis #2, that will certainly change my view. Now this…can I call it a watershed event? Interesting, very interesting. I enjoy your writing and insights. The atmosphere is only a minor player in global climate. The oceans are where the vast majority of our climate is determined. If we see a rise in atmospheric temperature like this so suddenly, then this is almost certainly the result of heat release from the oceans. UAH has been using the AQUA data since 2002 and therefore no longer applies an orbit correction however the reference data for calculating their anomaly was done with the satellites which used orbit correction. Since that time their anomalies show a pronounced minimum in May/June, it seems likely to me that this is a result of the shift in methodology and until UAH really resolve that I can’t take their monthly data seriously. According to latest measurements the equatorial ocean heat content anomaly between 100 and 180 Western longitude is the highest since 1998 (more than 1 deg.C above normal). It is possible that we are entering into the strongest El Nino event since 1998, see p. 9-10 for charts and further information on this topic. There is an outlook and some model projections for the oncoming months on page 27, where you can read the following: The models disagree on the eventual strength of El Niño (+0.5°C to +2.0°C), but nearly all of the dynamical models predict a moderate-to-strong episode. 1998 was a significantly stronger El Nino event than the oncoming one could be with a negative PDO. But our warmest year occured 11 years ago and if the AGW hypothesis is correct, we should’ve seen a steady warming trend of about 0.2-0.25°c/decade. Now we have to see warmer temperatures in the case of a moderate El Nino for at least 3-4 consecutive months than in 1998 in order to confirm AGW. If it is not going to happen, then the ‘Hockey Team’ will be proven wrong again. The results of this real world test will certainly influence my viewpoint on climate science. Maybe it will influence the overall viewpoint of thousands of reasonable people who are interested in this topic, including myself. So, we’re getting blasts of Arctic cold air migrating South. That air is coming from somewhere. Doesn’t that necessarily mean that the Arctic will be a little bit warmer as that cold air driving South is displaced? That’s why I hate this Anomaly stuff, especially global anomalies. It’s meaningless. What’s important is weather, and temperatures, in the latitudes where our food is grown. Regardless of the outcome, isn’t it nice to have real data (not filtered, adjusted, and model derived) with which to test competing hypotheses. Which data are you referring to? Certainly not UAH which doesn’t meet any of your criteria. All in all, the current upward spike in AMSU-A Channel 5 (600mb) doesn’t seem so unusual. The same occured in 2005 and 2007. Note the common “spiky” behavior of the mid-tropospheric temperature, possibly tied to tropical activity. If you can explain the exact cause of the periodic spikes you win 300 quatloos. This is the channel 5 temperature with the 10-year mean subtracted, to remove the annual cycle. So, the expectation is that the current spike will settle, but to where? Surely, you jest, Dr. Pielke. This must be a tongue-in-cheek hypothesis competition. The problem is that too many readers are taking the contest seriously, even though most of us know that Hypothesis #1 is the near-term winner. (Dr. Pielke must be talking to the scientists who are beginning to understand that they are caught in a web of [self-snip]). To make this latter case, even if sarcastically, is a problem. If Earth is in a cooling trend longer than “the last few years”, say, for the next 15 years or so, Earth should [Earth and Sun and Cosmos willing] return to warming “in the coming decades”. If we do so, is it because of “well-mixed greenhouse gases warming”? GISSE__________One of the GISS GCMs, which include E, F20, F23, M20, etc. It’s good to see the Air Con ad. For the polar regions to have exhibited the thermal variations noted, then WHY, OH WHY were not those VERY SAME variations noted elsewhere on the globe, and with the VERY SAME intensities? For the polar regions to have exhibited said thermal intensities, there must have been co-equal thermal events ELSEWHERE. Well, if the satellite is, indeed, drifting to a warmer part of the day by moving a little westward on the day side of its orbit then the temperatures can not be compared until, as kmye above noted, the diurnal adjustments are made after the end of the month. So comparing data during the month to data that has had the proper adjustments applied is, as stated, an apples to oranges comparison. It is like taking a daylight and a night reading and slowly changing the times you are taking the readings from say 11 o’clock to 11:30. The AMSU-E daily data is NOT derived from AQUA, so you are comparing apples to oranges. What exactly is your point? UAH data is calibrated to traceable standards and verified by balloon data, whereas near surface data has never been calibrated, maintained or otherwise verified to any standard commonly used in industry. Yet some defend the surface station network is A-OK. Amazing. What is your opinion of RSS? msadesign – there is a more complete list of acronyms at Climate Audit . To us laypeople , the use of some of this jargon can be confusing . I hope this helps . Calibration range. Upper/lower limits, model driven bias ….Good question. Please note that the temps on our “real-time” website are not considered calibrated against the full record as they are derived from NOAA-15 (a drifting satellite) rather than AQUA (a non-drifting satellite). NOAA-15 has been drifting into a warmer part of the day, so its anomalies will be slightly too warm – but on a daily basis it is not really possible to say what the error really is. Our calibrated daily values will be out after the end of the month. The sensor is either calibrated or not. Tweaking a bias does not a calibrated sensor make. Regardless of the outcome, isn’t it nice to have real daat (not filtered, adjusted, and model derived) with which to test competing hypotheses. Now, I know this might be somewhat heretical in the modern era of AGW hysteria (and Swine Flu hysteria, and _______ hysteria), but nothing like some actual hard science once in a while. “Hypothesis #2: Alternatively, if the large anomaly persists, it will support the claims by the IPCC and others (e.g. see Cool Spells Normal in Warming World) that well-mixed greenhouse gas warming is the dominate climate forcing in the coming decades and is again causing global warming after the interruption of the last few years”. Am I dreaming or is he really offering to eat his hat? Who cares about the daily UAH, without drift correction (as confirmed by Spencer) it’s not really worth much, note many questions on here the last couple of months as to why the daily ch5 didn’t agree with the monthly data. My comment referred to the monthly data which is maintained on the correct orbit however I refer to earlier comments about the anomalies which I think are flawed for the reason given. The daily ones certainly aren’t, are you referring to the monthly ones? Probably more reliable for anomalies because of the UAH flaw mentioned above. I still fail to see how this would be helpful to AGW. Am I overlooking something? Question: has radiosonde/balloon data confirmed this sudden anomaly at 500mb? Well, if Dr Pielke was tongue in cheek, then he reeled me in hook line and sinker..
Oh well, not the first time I’ve been caught! I hope Dr. Pielke is not going to toss in the towel over a short term spike. Thanks for your graph, it’s interesting.That’s global I take it? OMG, Al Gore was right… maybe this is the famous “trigger” and “point of no return” !!! … or it could just be from one of those sudden atmospheric hot flashes that we see every now and then. Guys– perhaps an explanation of some of the acronyms …. it will get answered sooner or later. The apparent lack of hurricanes redistributing heat may be a factor. I should think the large, recent warm anomalies over Antarctica would be impossible to attribute to a change in CO2 forcing, as there is currently no incoming solar radiation to trap in the high southern latitudes. It is clearly a phenomenon of atmospheric circulation: the heat had to be imported from somewhere. There must be something very fundamental to learn here about the genesis of an El Nino in the Pacific. What has changed in atmospheric circulation to raise the anomalies over Antarctica at a time when the sun is not shining there? Have we reached the tippling point yet? I should think the large, recent warm anomalies over Antarctica would be impossible to attribute to a change in CO2 forcing, as there is currently no incoming solar radiation to trap in the high southern latitudes. The GH effect is about ‘trapping’ IR leaving the earth not solar incoming. How much IR does -70C ice emit? The CRU global radiosonde dataset (HadAT) is getting updated only four times a year. We will be able to check it around late October or early November. The spike will not persist, at least not for months. We may get a warm July and August but SST’s seem to be on their way down again and on the TAO site, when you look at comparisons against this time last year like wind speed and warm pocket intensity, it’s starting to not look good for the prospects of El Nino to last through next Winter. Well to me it is simply a malfunction of the method of measurement. don’t forget that we are going through the lowest solar minimun since “space” records began, so the upper atmosphere is a lot cooler than normal (hence the noctilucent cloud formations), therefore the satellite is not correctly configured to see through an upper-cooled atmosphere…it was after all launched and set up in a solar maximum period! Satellite derrived products will always be subject to anomalous readings. Our Meteosat range of satellites for example , when in the water vapour frequencies, can only see down as low as around the 10000 to 13000 FT above Mean Sea Level heights…and that is in exceptional conditions. To see any lower at these frequencies, the atmosphere would have to be half as dense with respect to water vapour. If you cannot measure it yourself with a mercury in glass thermometer, disregard it as being inaccurate. Global temperatures are now being measured with electronic sensors. when compard with mercury in glass, they always come up 0.2 to 0.4° Celsius above the Mercury measurement….guess how much the earth has allegedly warmed in 20 years? 0.2 to 0.4° Celsius! spot on! Nothing has changed, only the method of measurement and the amount of recording stations. We still do comparisons between the two, and the same increase is still evident throughout the world, even almost 20 years since the electronic devices became widely used. End of Anthropological Global Warming Theory….Period! But what does it trap if there is no incoming radiation because the sun stays below the horizon until September? Is there suddenly more CO2 in the atmosphere to trap the radiation that has been escaping all the dark winter long? The winter warming over Antarctica is clearly not a direct result of changes in the radiation balance. The radiation balance will remain very negative until the sun shows above the horizon. The question is what happened in atmospheric circulation to bring the relatively warm air over central Antarctica. Remember all, that UAH has given us a handy little tool to look at global temperatures on a daily basis from AMSU-A satellite data. The satellite used by the tool is NOAA-15, which is drifting and no longer used by UAH for the official data (NASA Aqua). I find the tool interesting and useful even if its not the most accurate of the AMSU satellites. I noticed the same weakening of the El Nino temperature and trade wind patterns in the last week or two. It is very interesting. I suppose it could be a reversal of the El Nino that NOAA has announced is imminent. It could also be a blip on the way to longer lasting El Nino conditions. The oddest thing is the very positive SOI in the middle of the alleged incipient El Nino. I have a hunch something very interesting is happening in the atmosphere, particularly in the Southern Pacific. My problem with the AGW models is that they purport to be predictive of the future temperature trends of the atmosphere, even though they are modeling a system for which we have but the vaguest understanding. Basically the models are a test of the hypothesis that the concentration of Greenhouse Gasses and a completely hypothetical positive water vapor feedback are the primary controlling factors in global atmospheric temperature trends. The fact that there is no tropical mid tropospheric hot spot and the fact that the Arctic is currently no warmer than it was in the late 1930s seem to me to pretty much point to the falsification of the hypothesis underlying the AGW models. It seems to me the funding behind climatic research is pushing toward the quantification of AGW and its effects. The far more interesting issues – ones I feel are much more deserving of funding – revolve around the causes of the long and mid term climatic cycles that we are just starting to understand. When I was active in Paleoclimatology about 15 years ago, the North Atlantic deep Water Circulation and its relationship to El Nino was the hot issue. Now we have the AMO and PDO and various solar linkages that also demand attention. Instead the funding agencies have put all their eggs in the AGW basket. This seems to be the pattern with funding. Whatever the hot issue of the day, it must be worked into a funding proposal if the proposal is to succeed. When the Younger Dryas was the hot issue, everyone had to see the Younger Dryas in their data. Even the most unconvincing blip in any of the various temperature proxy was called the YD if it was of the correct age. It led, in my opinion, to a lot of bad science done just to justify further funding. Now we are seeing events in the atmosphere that herald some interesting changes. The AMO. PDO, and El Nino seem to be doing something interesting all at the same time. Sadly, the main issue seems to be “what does this mean for AGW” rather than “what does this mean about how the atmosphere-ocean system works.” What I want to know is what causes ice ages, the Daansgard-Oeschger cycles, the AMO/PDO cycles and the rather chaotic but also somewhat regular variations of the ENSO? I guess I have become a denier not just because I am unconvinced by the data that is supposed to support AGW, but because I feel the current obsession with AGW is masking the truly interesting issues in atmospheric science. I left science 15 years ago because I felt that the funding system did not give me any freedom to study what I thought was important. Now I see nothing that makes me want to return to academia, but I find the actual science more interesting than ever. If we can just pull our heads out of the AGW sand, we are close to some very interesting discoveries about how the planet works. Sorry about the rant, but I had a tough week and I need to let off some steam. I hope it is equipment problems, because otherwise you are right and that is double whammy bad news. Atmospheric temperatures will go up for a while allowing the AGW crowd to claim they were right and push through their massive wealth destroying measures. Oceans lose heat and we are headed for a prolonged period of a colder climate with all that entails. Pointing in that direction is the SH sea ice which shows a sharp upward trend over the last 2 or 3 years. As does the NH sea ice, but that was off record low levels. What was the source of the data which produced the UAH anomaly baseline? Mike: With that in mind does that mean that every monthly global temp. reading may have to be adjusted downward to correct the bias created from the move away from mercury based readings? That will surely make the warming trend look less impressive, particulary if it’s shown it suggests the world didn’t warm that much if you would’ve spent the last 30 years measuring temps. the old way. Maybe you should write an in-depth article on satallite calibration and biases and comparisons of the biases and accuracy of different temp. reading devices used over the last century of so? I’m tired of anomalies. Anomalies assume a that this earth has a normal mean temperature. It does not. Our time would be better served trying to deal with short term weather events than to project what changes in 30 – 100 years will be. Who is to say we wont get wiped of the earth by the next bit of space rock that passes our way a year from now? Should we live in fear of that? They say its only a matter of when. Maybe we should wreck our economy for that huh?? It seems rather stupid to me that we are trying to give the ENTIRE world a temp. But ignore regional weather events. Its hot here today, but it wasn’t a week ago. Does my current temp add to climate fears. NOPE we didn’t even break a record, yet it will be used to prove the world is getting warmer. Our current methods of taking temp, whether they be ground or satellite are flawed, the scientists know that or they wouldn’t have to dink around with the data. So why in the heck are we assuming anything based on them? Even if it warms up tomorrow because of an El Nino. Is it the Co2 that did it or the El Nino? La Nina broke the pattern, but it was weather. If the El Nino returns you know it will be climate. That’s just CRAP science and I for one am SICK of IT. you are probably refering to such an unfounded comment from flanagan, however, if you look at channel 5 data by yourself and try to average the difference to the 20 year average over a month, it fits very well with monthly averages. Ocean temperatures for June (http://www.ncdc.noaa.gov/oa/climate/research/2009/jun/global.html#temp) are warmest on record. Only a tiny 0.1C below the land anomaly… (so much for UHIs). Ocean sea levels approaching new record highs (http://sealevel.colorado.edu/current/sl_noib_global.jpg). The MSU has been the outlier all year, and has now caught up with the rest of the data. One suspects it as problems as the drift away from the surface earlier in the year is improbable. And to think – this record heat is all occurring at solar minimum less than 6 months after the end of the 2007/2008/2009 La Nina. Global temperatures correlate most strongly with ENSO at 6 months lag (it should be COLD now), not setting record highs. Sorry for my ignorance, but with reports from all over the globe of unseasonably cold temperatures, how can this be accurate? What is this series measuring and has it gone through an adjustment process? I am just confused by hearing the this is a hot summer when I am still wearing a fleece at night in Chicago. I did notice that GISS omits outliers. Like the 45ºF day in June we had in Ohio? That seems kind of biased in its own way. Am I understanding that process correctly? Re tallbloke, yes that’s a global plot. I’m intrigued by the oscillatory behavior and by the swift increases and decreases and the apparent baseline stability. Perhaps the oscillations are thunderstorm-related, with the heat spreading out across the troposphere and dissipating. If it is real and not some measurement artifact then understanding the physical behavior behind the plot would be valuable. By plotting together 2003, 2005 and 2007, just three relatively warm years from this cooling period Pielke asserts doesn’t exist anymore because of very high temperature on one day in July 2009 (!!! ), you would easily see that out of those 1000 days you can find certainly couple of dozens of days with higher global temperature anomaly than yesterday. Just in January 2007 you have at least 11 or 12 days with higher anomaly. In December 2003 you have also at least 6 or seven days with higher anomaly. In August 2005 you have additional 5 or 6 days. This is almost 25. I have found this in 5 minute inspection. When other years included and all checked out I bet at least 50-60 days in last 6-7 years would have higher anomaly than yesterday. Even if yesterday highest anomaly in last 10 years was observed that would mean little, nothing to say about 50th or 60th highest anomaly in 7 years or so. If Pielke Jr wants to advocate AGW he should do so openly, instead of finding so stupid excuses. The antarctic warming seen here I have seen before (late winter 2008) and can be blamed on the sun.The resumption of solar coronal holes is evident in the ice-form graph at “Chryosphere Today”. How these coronal holes warm the antarctic is less certain, I can only think of 3 options. (2) High cloud formation over the antarctic caused by high velocity SOLAR protons. (3) Alteration of polar air circulation. It seems likely to me that all three play a role but I must say I am interested in cloud formation a lot. High altitude ice crystals forming in the cold of later winter would reflect solar irradiance down to the surface, then, away from the surface in later spring. Although I anticipate a large arctic ice melt causing a cooling of pacific equatorial sub surface temperatures,if the coronal holes continue to limit antarctic ice formation through to September, another smaller than average antarctic ice melt would likely see an intensifying El Nino into the SH summer. If, however, we get a resumption of weak sunspots and no coronal holes a very large ice formation should result, which as it melts could easily lead us to another La Nina summer. It is too early for the El Nino to be affecting the troposphere. In fact, the outgoing long-wave radiation data is showing that the Pacific ocean is absorbing heat energy out of the atmosphere right now rather than adding to it. Every now and again, I’ve been checking the temperatures in Antarctica and, certainly for the coastal areas, they are having the mildest winter probably on record. I know I lived with temperatures this winter that were far colder than the Antarctic coast is experiencing in their winter. The sea ice is not really reacting to the conditions as it is still well above average, but then the ocean surface has to warm to -2C to melt the ice. Today, the Antarctic coast is still warm but the Amundsen-Scot station at the south pole is 10C colder than normal at -71C. So, like the weather in general, sometimes it is cold, sometimes it warm. After seeing corrupted data posted on a regular basis (until the agent responsible was “outed” – usually by interested amateurs), my BS meter is spiking with this one. Instrumentation drift, innocent blunder or outright fraud, I will assume one of these until confirmed by independent observation. you’ll note that 15 Jul 2009 is at 254.286K. Two years ago, on 2 Jul 2007 the temp hit 254.279K. Remember that the satellite has been drifting into a warmer part of the day this entire time, which I would imagine would be greater than the 0.007K difference over two years seen here. If temperatures warm suddenly at 500 mb, presumably via convection since CO2 levels do not change that suddenly w/o vulcanism , the dispaced cold air sinks to the surface, explaining the colder surface temperatures we have seen this summer at higher latitudes in the NH . The net heat content of the troposphere would be unchanged, and just distributed a bit differently. However, it could be the transitioning from La Nina to El Nino which is adding heat to the troposphere via convection and causing the same effect. Yet an earlier comment indicates the El Nino is not yet resulting in the oceans adding more heat to the troposphere as yet. Just a thought. We are still waiting for the first hurricane in the Atlantic- Caribbean Ocean, and we are only at C in the Pacific. Maybe the lack of clouds is heating the atmosphere to more than normal? Speaking of the Sun the Solar Flux has dropped to 66 now, isn’t the Earth supposed to now be past the part of its orbit furthest from the Sun, it doesn’t neccesarily make sense unless Archibald really is on to something. You feel that Roger Pielke Jr advocates the IPCC / AGW position? To that I say ridicules. Anthony has also included a glossary on this site… Near the top. more than 30% of 0C ice. we just observed a few days that hardly even scratched Hansen’s model B scenario. AGW believers still think model B or slightly higher is were temperatures should go (CO2 up, methane down since 1990). Subtract an el nino correction from july data and we may arrive again even below scenario C, where we have stayed for years now, subtract an additional term for land use change and there is hardly anything left. scenario C drastically reduced greenhouse gas emissions after 1990). It looks like the peak has been reached on UAH, the mean temp on ch.5 dropping a bit between the 15th and 16th. Hopefully we see it decline back to average or below as fast as it rose above it. Meanwhile, the sun remains quie again. Nearly a week of blank days and counting. How does the atmosphere radiate heat into the ocean? I thought longwave radiation didn’t penetrate the surface. George E Smith has written extensively on this. Are you downloading and plotting data or are there some online graphs to illustrate what you are saying? Too regular in amplitude over the year for thunderstorms I’d have thought. Do you know where the plot came from? Is it raw data? Can’t see any orbital adjustments applying to a month long signal though. I’m intrigued by the oscillatory behavior and by the swift increases and decreases and the apparent baseline stability. I’m thinking that IR doesn’t penetrate far into water, not because it gets reflected but because it’s strongly absorbed. The water below is then thermalized through collisions. Presumably, heat is also returned to the atmosphere by increased evaporation, with convection determining net transfer. Presumably, heat is also returned to the atmosphere by increased evaporation, with convection determining net transfer. For most of the oceans for most of the time the oceans heat the atmosphere. If this wasn’t true, one consequence would be it wouldn’t rain much anywhere. Rain results from evaporative cooling of the oceans. In the cloudy tropics, ocean regions may gain net heat from the atmosphere as clouds block sunlight and the water vapour greenhouse effect is high producing large amounts of return IR. Outside the tropic, my understanding is the atmosphere never heats the oceans. Except perhaps locally for short periods. It is always the other way around. The solar wind was much greater than it has been for a while over this period, in terms of velocity and density. If the atmosphere cools, its volume will contract, and, in fact, the ionosphere is apparently low these days. If the atmosphere were compressed, by, say, solar wind bursts, it would heat up. Is there any data on the effect of the solar wind on the height of the atmosphere? Manfred: and if you look at the May data, they were largely above average for 90% of the time, nevertheless the anomaly was +0.04 C, with the graph showing most of the time +0.1 to +0.2 C.
Burke: probably because “record colds all over the world” are strongly biased informations. There were also a lot of heat waves in June (India, China: hundreds of deaths because of sizzling weather, heat waves in Texas, etc. ), you only need to pay attention to them. I’m thinking that IR doesn’t penetrate far into water, not because it gets reflected but because it’s strongly absorbed. The water below is then thermalized through collisions. Hmmm, it’d be good to know the proportion of the heat which is thermalized into the water, as against the heat going into the latent heat of evaporation and transported upwards. I suspect it’s the latter by a long way. Dunno, that’s why I asked David. Sorry, the link needs a feed and does not work above. “What is your opinion of RSS? I think you have little logical problem here. If you think that RSS data are more reliable than UAH, that only could mean UAH has some “cooling bias” in their data. One sees the undulations, and the present one is not unusual. David’s plot is interesting because it unravels the spaghetti. There are about 16 to twenty dips and troughs a year, so yearly superposition obscures the order in the disorder. This is why many are so off the mark when attempting to calculate monthly anomalies using daily data without benefit of knowing the diurnal drift adjustments (which vary constantly) necessary to calculating the actual. Sure it would be nice to have daily AQUA data, and maybe at some point it will be available, but as it is now, we live with what it is. In our hypothetical example the air is warmer than the water, so, following the 2nd law, net heat transfer would tend from the warmer to the cooler. Advection of latent heat in water vapor out of the system must be the dominant influence. As I understand it, radiative energy transfer at these densities of matter (including 1 bar atmoshere) is insignificant next to conduction and, in fluids, subsequent convection. As we know, the heat in the air got there in the first place from the surface, which is, on the whole, warmer than the atmosphere. “You feel that Roger Pielke Jr advocates the IPCC / AGW position? If somebody says, as Pielke did, that couple of days or maybe a week or very warm temperatures could be a test for AGW hypothesis while 10 or 12 YEARS are not good enough test – I think that you would agree this is quite ridiculous. And specially when he himself easily do what I did – check that in last 7-8 years you had at least 50-60 days with higher anomalies than 14 or 15 July. And if someone says “July 14th may or may not have been the warmest day ever, however it does portend an end to the debate over global “cooling.”” I also hope you would agree that this sentence looks pretty stupid (if 10 years of cooling are “weather” how than 5 days of warming can be a “climate”? i.e. “portend end of debate of global cooling”). Since it is obvious he is very smart man, only thing I can conclude is that he is trying to keep his credibility in the “community” for his policy views, by balancing them with castigating “extreme denialism” in climate science itself. I cannot believe that intelligent man can seriously think, without some agenda in mind, that couple of very warm days can prove anything concerning climate change, nothing more than couple of cold days (specially when those couple of warm days are by no means “unprecedented”). I should say UAH has “warming bias” in previous comment. I don’t have any problem, since UAH started using AQUA in 2003 they have shown a strong pattern in the anomaly, in particular the May/June minimum. To me that indicates that the mean developed using the previous satellite isn’t consistent with AQUA, what effect that has on the trends really doesn’t concern me, if the data’s bad who cares. If the ocean surface does not absorb infrared radiation, then all of the warming of the ocean surface over the last 100 years (0.5C or so) would be due to an increase in solar short-wave radiation or through collision exchange between atmospherice and ocean molecules. So, either the ocean does absorb infrared or it doesn’t matter anyway. In addition, it doesn’t seem reasonable that water vapour in the atmosphere would absorb infrared but liquid water would not. Does a glass of cold water in a dark room eventually warm to the ambient temperature of the room. Does it take a long time for that to occur. Not since the advent of AQUA, in that period the annual cycle is much greater, which was the point I was making. Hi Bill, looking at Nicola Scafetta’s recent presentation and the Hoo Flung Dung over the adjustments to TSI satellite data by the PMOD team, it does seem possible that all the extra heating since the end of the little ice age is solar in origin, yes. The 10 micron IR radiation is absorbed in the first 10 microns of the ocean surface at a rate of over 300 watts/m^2. It promptly evaporates molecules of water on the surface which then head upwards. That’s why the atmosphere can’t warm the ocean to any significant degree. The glass of water warms through conduction via the vessel it’s in. Phil, you said in your first comment that UAH started to use AQUA satellite since 2002. Now you say it was since 2003. It seems that cooling trend in RSS is again bigger than in UAH, and that difference increased compared to 2002. That means “warming bias” in UAH increased as well since switching to AQUA. Your initial objection was that UAH official data are too cool particularly in May and June because of shift in methodology, and that you consider RSS data to be more plausible because of that. That means you think UAH has an artificial warming bias in the new data, that should be corrected. Does UAH has artificial cooling, as you imply now, or artificial warming since 2002 (or 2003), as you implied in your first comment? I think Pielke was setting up a straw man and having some fun. Since day 221, 2002, the first complete year being 2003. You’re imagining things it’s not me who’s talking about cooling and warming biases, I just don’t think that their recent anomalies can be relied upon because of the change to AQUA. I didn’t say there’s a general cooling rather a systematic minimum in May/June. Bill Illis (08:20:02) : The glass of cold water isn’t as simple as it appears. Are you talking humid air or perfectly dry air? Water will condense on the container if it is a simple glass or metal container and cool the liquid faster than dry air. But eventually, both will warm the liquid. Ivan (07:49:40) : It would be difficult for RSS or UAH data to be worse than GISS data. Even with flaws, I’m betting the satellite data is 10 time more accurate. I agree completely. RSS and UAH trends match pretty well, both over the whole period 1979-2009, and since 1998. Difference are relatively small and are located primarily in early 1990s, as far as I know. RSS 1979-2009 trend is 0.15 deg C, UAH 0.13 and since 1998 both have negative trends RSS being somewhat larger. That tells you that probably those two sets are relatively reliable, in any event much more than any of ground-based data sets, plagued by myriad of problems, like UHI, poor siting, inhomogeneities etc. First I averaged the data for each day of the year. The result shows how the channel 5 temperature varies, on average, over a year. I then subtracted those daily averages from the actual 2008 and 2009 temperatures for the dates, creating an anomaly plot for 2008 and 2009. It’s a simple spreadsheet operation. The oscillatory behavior is found through much of the data and seems to be on a 30 to 50 day cycle, but there are stretches without clear oscillation and stretches where the periods are different from the 30 to 50 day norm. I’d just like to be able to connect it to something in the atmosphere. I did send a copy of this type of plot to one of the satellite/climate scientists (won’t mention his name without permission) several months ago and he said it is real atmospheric behavior, not a satellite data artifact. UAH channel 5 data for yesterday is up. Even higher than the July 15th peak. Don’t you think the wall of the container will be warmed by condensation? Checking 14000ft today I see it’s got its second wind and is continueing to rise again http://discover.itsc.uah.edu/amsutemps/execute.csh?amsutemps+002 Surely something is not right? Yes I know about the issues to which you refer in your post. However I haven’t mentioned AMSU Ch 5 temperatures – not for a while anyway. I do though expect some increase in satellite tempearures over the coming months. Whether this current spike is part of the expected rise – I don’t know. Thanks David. Very interesting. So did your climate scientist offer any ideas for the behaviour. Those are biggish swings – 0.4C or so. Cloud behaviour? Not on a global basis surely. Hmmm, Lunar effect?? Surely not. Hmmm. Keep those quatloos handy, I’ll work it out. Hypothesis 1 sounds reasonable, especially if we factor in the Sarychev Volcano eruption and the mixing of that ash and aerosols into the upper atmosphere. It might be reasonable to assume that ash and aerosol in the upper atmosphere could potentially absorb IR and then radiate that heat? If the southern hemisphere does not show the anomoly with any correlation, that would further support the volcanic event as other models have shown the length such mixing takes. Not sure I have ever seen a mapping of upper atmosphere temperature changes related to volcanic output. Has anyone else seen that? And if the IR was stopped at the upper atmosphere, the lower atmosphere would cool? We have seen cooling before at the surface from significant events. Hmmm? /Sorry for the usage – I was an econometrics major a long time ago, not a physical sciences major. Can this chart be linked for continuous updates as the AMSRE Sea Ice extents and Artic temperatures are now linked on the home WUWT web page? This would look impressive, since it would be the first big gap over a last year’s high. The higher elevation graphs are all current. At 14,000 ft, the 7/23 plot is shown, at .73 deg F warmer.